A lightweight oil-free version of our popular creme. 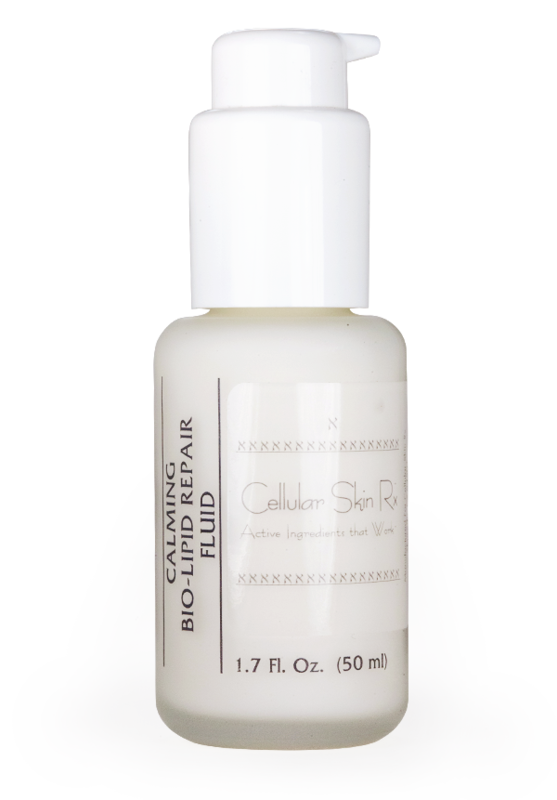 Calming Bio-Lipid Repair Fluid moisturizer uses Rosemary and other lipid-rich ingredients to repair and moisturize skin while Sea Whip and Green Tea Extracts calm sensitive skin and reduce visible redness. Soluble Beta-Glucans stimulates skin to form healthy connective tissue over time. Skin immediately feels softer and calmer, stays moisturized for hours. With long-term use, skin will look healthier, become less sensitive and feel more comfortable – even in the presence of irritants that caused reactions in the past. Calming Bio-Lipid Repair Creme provides all of the benefits of the lightweight fluid except in a richer formula. The creme formula is wonderful for use during the colder months of the year when skin needs more soothing hydration. Calming Bio-Lipid Repair Fluid is perfect for daily use over C+ Firming Serum, SuperMax MultiPeptide Skin Solution Serum and/or ProgeniDerm™ Anti-Senescence Skin Stem Cell Serum. The fluid is also recommended for use on skin that has recently undergone microdermabrasion, chemical peels or laser surgery.